^ The discovery of early pottery in China 互联网档案馆的存檔，存档日期2007-06-14. ^ Diamond, Jared. Japanese Roots. Discover (Discover Media LLC). June 1998 [2006-03-23]. （原始内容存档于2006-03-16）. ^ Kainer, Simon. The Oldest Pottery in the World (PDF). Current World Archaeology (Robert Selkirk). September 2003: 44–49 [2006-03-23]. （原始内容 (PDF)存档于2006-04-23）. ^ 14.0 14.1 Roman Pottery. [2008-07-02]. （原始内容存档于2008年6月22日）. 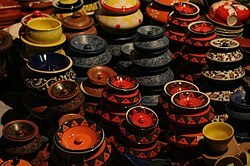 ^ Ancient and Medieval Pottery. [2008-07-02]. ^ 18.0 18.1 Japanese Traditional Pottery. [2008-07-02]. （原始内容存档于2008-03-09）. ^ A History of Pottery. [2008-07-02]. ^ Stone Age Greek Pottery. [2008-07-02]. （原始内容存档于2008年5月12日）. ^ Early Bronze Age Greek Pottery. [2008-07-02]. （原始内容存档于2008年7月2日）. ^ Late Bronze Age Greek Pottery. [2008-07-02]. （原始内容存档于2008-07-04）. ^ Dark Age Greek Pottery. [2008-07-02]. （原始内容存档于2008年9月5日）. ^ Geometric Greek Pottery. [2008-07-02]. ^ Greek Black Figure Pottery. [2008-07-02]. （原始内容存档于2008-06-20）. ^ Greek Red Figure Pottery. [2008-07-02]. （原始内容存档于2008年6月20日）. ^ Stone Age Chinese Art. [2008-07-03]. （原始内容存档于2008年7月4日）. ^ Shang Dynasty Chinese Art. [2008-07-03]. ^ Chou Dynasty Chinese Art. [2008-07-03]. ^ Chin Dynasty Chinese Art. [2008-07-03]. ^ Han Dynasty Chinese Art. [2008-07-03]. ^ Tang Dynasty Chinese Art. [2008-07-03]. （原始内容存档于2008年8月28日）. ^ John Stewart Bowman. Columbia Chronologies of Asian History and Culture. Columbia University Press. 2002: 170p. ISBN 0-231-11004-9.